“I will draw a picture of the Reading Room because it is my favorite place in my community!” says Elena, a regular visitor. 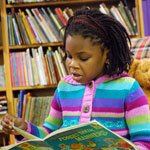 The Cops ‘n’ Kids Reading Room is open to the public every Thursday, 11:00 AM – 7:00 PM. Special programs are held on the 1st and 3rd Saturdays of month, 11:00 AM-12:00 noon. Take a look at “What’s Happening” in the Reading Room. The Cops ‘n’ Kids Reading Room, in collaboration with the Easton Area Community Center, provides a comfortable and welcoming place for children and families to read together, share stories, and select up to three free books to take home on every visit. Police officers, high school and college students, community volunteers, and various community organizations participate in the programs that are provided in the Reading Room. Special visits and programs can be planned for groups (storytelling, special appearances by authors or other learning experiences connected to a specific curriculum or classroom topic.) Teachers and group leaders may select larger quantities by contacting us. 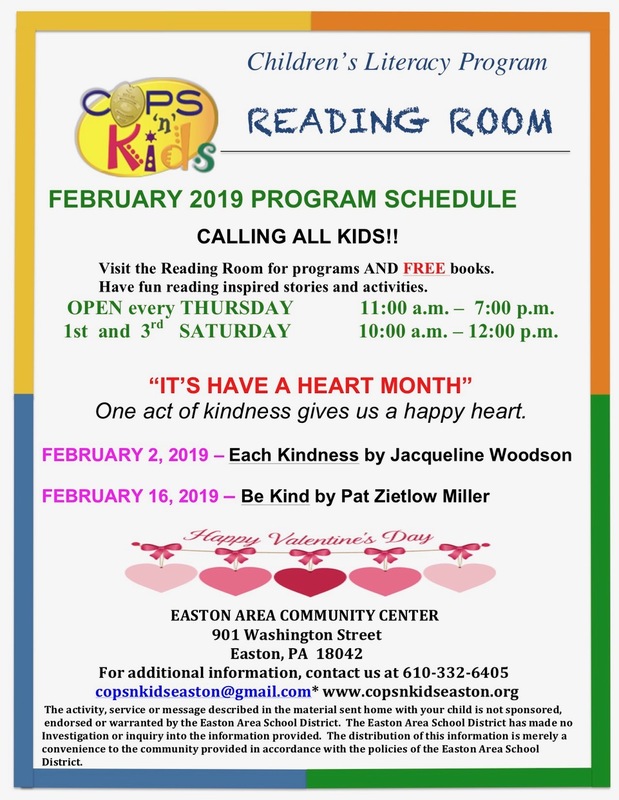 The Cops ‘n’ Kids Reading Room is located on the lower level , Easton Area Community Center, 901 Washington Street, Easton. Phone: 610-250-6562. Reserve a date for your group. Download the form in Word or as a PDF file. You can send it by regular mail or attach it to an email (copsnkidseaston@gmail.com).